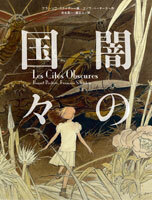 The release of “Les Cites obscures.” is the latest of ShoPro's expanding line of foreign comics and graphic novels translated into Japanese. “L' Enfant Penchee” (The Leaning Child). Translated by Shinichi Furunaga and Masato Hara, the 400-page book costs 4,200 yen ($54). This blog post was created on 2011-12-24 at 11:52 and last modified on 2018-05-06 at 08:40 by Joseph Le Perdriel.